It’s official: our state is the country’s leading tech hub. The statistics bear it out. Our tech industry – which employs about 160,000 and brings in $35.3 billion annually – is home to many of the nation’s top 20 technology companies, and we’ve also lured an impressive Who’s Who of global technology leaders to establish regional headquarters here, including Alibaba, Amazon, Dialog, Slack, CyberGym, Hired , Zendesk and Square. Which makes sense, really, given Victoria has one of the lowest rate of business tax of any Australian state and offers investors some of the world’s most generous research and development (R&D) support in a cost-competitive business environment. As a result, KPMG ranks Melbourne as having the most attractive R&D location costs in the region. Our tech sector is carving a name for itself most notably in software development, cloud technology, digital games, mobile technology, social networks and data analytics. And Melbourne, in particular, is getting its fair share of tech accolades, including being ranked as Australia’s top ranked Tech City and awarded the 2017 Intelligent Community of the Year. We’re an educated lot in this realm, too – Victoria produces 37 per cent of Australia’s digital tech graduates, compared to 28 per cent in NSW and 19 per cent in Queensland – and we’re also noted for our cybersecurity stance. Victoria is building cyber and data security capabilities to make it Australia’s leading cyber security location globally. The establishment of the new Oceania Cyber Security Centre at Melbourne’s Docklands, along with a Data61 Cyber Security Innovation Hub. An agreement with Oxford University’s world-leading Global Cyber Security Capacity Centre (GCSCC) to establish a formal collaboration with the Oceania Cyber Security Centre. A Memorandum of Understanding with Israel’s Tel Aviv University. Establishing two fintech hubs in Melbourne’s Central Business District to be operated by Stone and Chalk and YBF Ventures. There’s no sign of a slowdown up ahead, either: by 2020, Victoria’s digital economy is predicted to soar to $50.8 billion. Digital and mobile payments pioneer Square made a push into Australia in March 2016, when it began operating payments out of its Melbourne base. Founded in 2009 by Jack Dorsey – who also happened to co-found Twitter back in 2006 – Square is a San Francisco-based publicly-listed company with a market capitalisation nudging $US17.2 billion. Branches are located in the United States, Canada, the United Kingdom and Japan, along with Australia. Square employs more than 2000 globally, and just over 30 of those work out of Melbourne. Local take-up has been positive, to say the least. Tens of thousands of Australian sellers are now using Square’s products and services, which are tailored towards small-to-medium (SME) business owners keen to start, run and grow. Square’s appeal is using affordable business technology such as card readers and business analytics tools – think cafes and restaurants, bars and clubs, retail stores, hair and beauty businesses, florists and market traders. 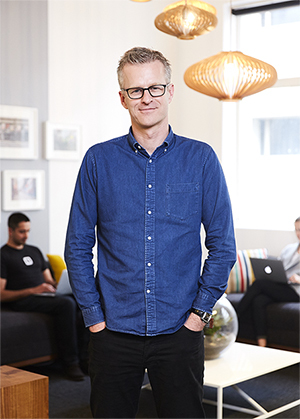 Square Australia’s chief, Ben Pfisterer, knows a thing or two about payments technology. He previously worked for Visa, managing their innovation roadmap across all emerging payment technology including the deployment of payWave, mobile payments, virtual wallet and EMV (Europay, MasterCard and Visa), the standard for credit, debit, and prepaid card payments using chip card technology. He also previously held senior positions at National Australia Bank, driving EMV migration, contactless deployment and launching one of the world’s first mobile payment pilots. Pfisterer is certainly not one to do things by halves. “I’ve always strived to help the companies I work for make sure that we’re constantly innovating or pushing the boundaries of what we can achieve,” he says, “and I’ve never been one to be satisfied in monotonous or routine jobs, which often results in me working on things that are difficult in nature. So why Melbourne for the Australian base? Square’s global achievement and its ability to successfully scale is down to two things, says Pfisterer – and it’s the same for any service-based company. One, do you provide a service that people want to use? And two, do you make it simple for them to do so? Entries for the Victorian Government-sponsored iAwards – hosted by the Australian Information Industry Association and recognising the achievements and innovation made in information and communications technology across the economy – close on 8 March. For further information and to submit your entry, visit the iAwards website. The Victorian Government is also a sponsor of DevOps Talks Conference (DOTC) 2018 in Melbourne, 22 to 23 March. DOTC presentations cover innovative technological developments and research such as cybersecurity, artificial intelligence, cloud, digital transformation and much more. For more information, visit the DevOps Talks Conference website.